Usd/Jpy continues trading within the range while staying in positive territory. Upside seems to have lost its strength, but giving its holiday in Japan, I’m expecting the pair consolidation continues. Very good resistance on the USDJPY at the 112.14 level, possible double top formation. Above the 112.14 level, its next resistance could be the 113.00 level. To the bottom, the 111.00 level may act as support. The pair seems to enter correction mood just below 112.60 level, appears no clear directional strength short-term. Immediate support can be found at 112.15 and resistance at 112.85. Hey traders. A more detailed analysis of the USDJPY trade and previews of upcoming setups next week. 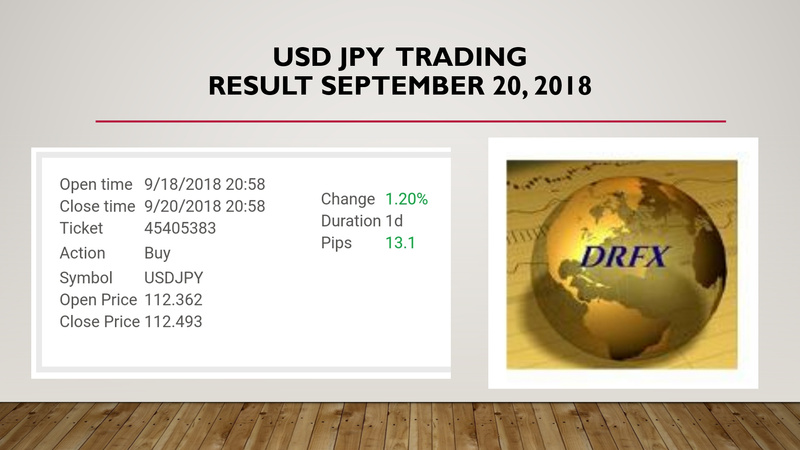 USD JPY 1.2% GAIN - DRFX PRIVATE VIDEO LESSONS SEPTEMBER 21, 2018. News day, ‘‘safe haven’’ Yen reacted and remain bullish. The pair is consolidating its gains at the end of the day, immediate resistance can be found at 112.86. I’m looking at critical 113.00 handle on the upside. Usd/Jpy bullish trend is still going strong, even though the pair is consolidating its gains for now. Next target is at 113.20 and I don’t see any sign bulls giving up. While Usd/Jpy remains positive, the pair has found psychological resistance level at 113.00 and 112 level as support. Correction movements might continue within the range. here is still room on the upside, critical resistance can be found at 113.70/80 zones, the pair could extend its gains if there is a breakout. The USDJPY may continue rallying above the 113.00 level, but be aware of a profit taking pullback that may take place, probably bringing the pair below the 113.00 level. Usd/Jpy is consolidating higher, the bullish trends remain strong. Next resistance is at 113.90/114.00 zone and follows by 114.40. The pair has been testing 114.00 level, the strong bullish tone remains. As long as Usd/Jpy stays above the support level at 113.68, upside extension could be further. Usd/Jpy is trading in a narrow range just above 112.00 level while the risk remains to the downside. The immediate support handle 111.80/90 seem strong, on the upside, resistance can be found around 112.50/60. The pair is consolidating, I’m expecting a further continuation on the upside if Usd/Jpy break above the immediate resistance at 112.73. Usd/Jpy risk remains on the upside, next immediate resistance can be seen as last month high at 114.54, the pair is in the position of retesting the level. Short term Elliott Wave View in USDJPY suggests that the pullback to 112.27 ended Minute wave ((x)). Internal of Minute wave ((x)) unfolded as a zigzag Elliott Wave structure where Minutte wave (a) ended at 113.07, Minutte wave (b) ended at 113.7, and Minutte wave © of ((x)) ended at 112.27. 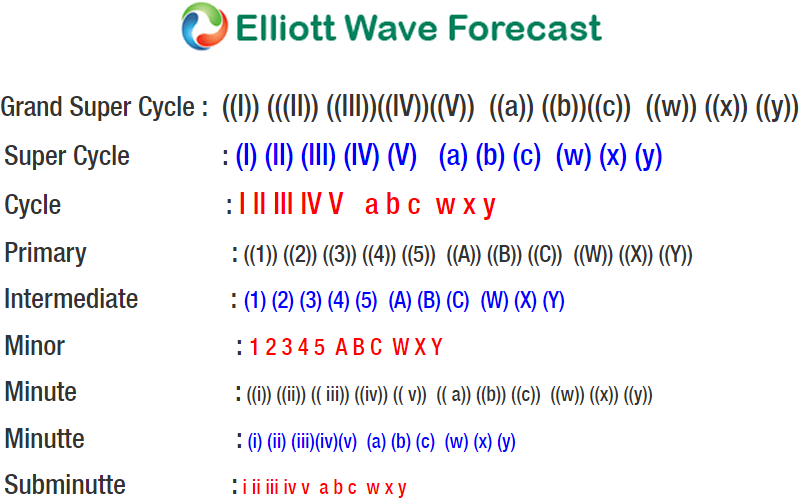 Minute wave ((y)) rally is now progressing as a double three Elliott Wave structure. 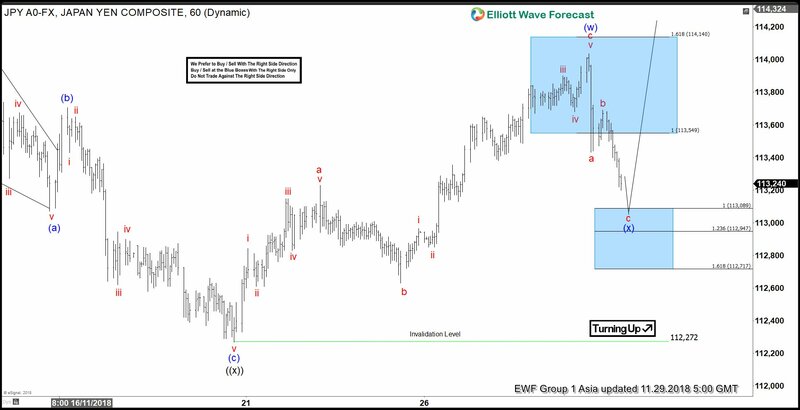 Up from 112.27, Minutte wave (w) ended at 114.04 with internal as a zigzag Elliott Wave structure. Subminutte wave a of (w) ended at 113.23, Subminutte wave b of (w) ended at 112.63, and Subminutte wave c of (w) ended at 114.04. Near term, Minutte wave (x) is expected to find support in 3-7-11 swing as far as pivot at 11/20 low (112.27) remains intact. We don’t like selling the pair. 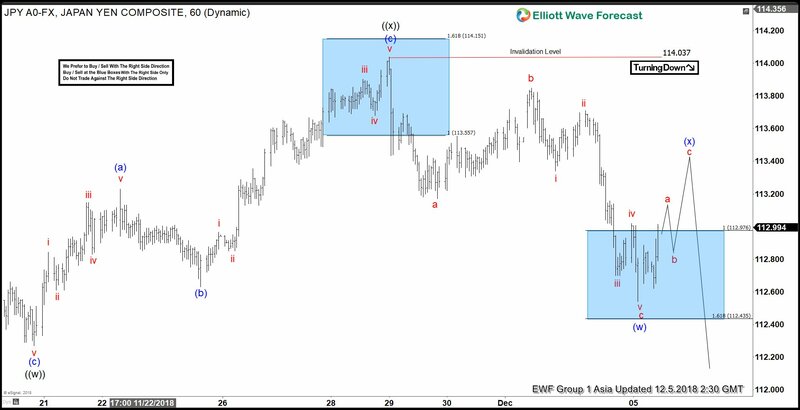 Short term Elliott Wave view in USDJPY suggests that cycle from 11/12 peak (114.21) remains in progress as a double three Elliott Wave structure. Down from 114.21, Minute wave ((w)) ended at 112.27 and Minute wave ((x)) bounce ended at 114.03. Internal of Minute wave ((x)) unfolded as a zigzag Elliott Wave structure where Minutte wave (a) ended at 113.23, Minutte wave (b) ended at 112.63, and Minutte wave © of ((x)) ended at 114.03. Minute wave ((y)) lower is currently in progress and the internal is unfolding as a double three Elliott Wave structure in lesser degree. Down from 114.03, Minutte wave (w) ended at 112.54 as a zigzag Elliott Wave structure, and Minutte wave (x) bounce is correcting cycle from 11/29 high before the decline resumes. We expect sellers to appear after Minutte wave (x) bounce is complete in 3, 7, or 11 swing as far as pivot at 114.03 high stays intact. The USDJPY rallies again to the 113.22 level, above its 55 day EMA, but the 114.00 level may act as resistance. To the downside, the 112.00 level may act as support. The USDJPY stays below the 55 day EMA at the 112.96 level and even though it has been losing its momentum, the price may continue falling to the 112.00 level. Above the 55 day EMA, its next resistance could be the 114.00 zone. Follow up on the USDJPY. The pair heads higher towards the 113.67 level, but the 114.00 zone could act as resistance. To the downside, the 55 day EMA at the 113.00 level is still its most relevant support level.